Home Community June DeLugas Interiors Style. Life. Love. As a creatively inclined young girl, June DeLugas accompanied her uncle to furniture auctions, fell in love with design at the tender age of 14, and never missed an opportunity to study the intricacies of great style. It was her uncle who refinished her first purchased piece – a writing desk made of birdseye maple. Always busy with a craft project, June also strongly felt the influence of her two talented grandmothers: one sewed quilts from a rack that came down from her ceiling, and the other collected pottery and family heirlooms that she would give June, one sweet treasure at a time. “I have now begun to pass them to my daughter, who appreciates the heritage and sentimental value of such things,” says June, as she reflects on her career of over 25 years imparting design wisdom to grateful clients in the Triad, Charlotte, and Lake Norman area, as well as Wilmington, and as far as Atlanta. In 2002, June opened her well-known design firm in Clemmons to showcase furniture, art, lamps and lighting (she admits to a slight lamp fetish! ), window treatments, carpeting, accessories, and even luxury bedding. And no doubt you are familiar with the both trendy and timeless design advice she offers through her Forsyth Woman blog, “Dear June.” Although she had previously put together a small showroom in the basement of the home she shares with her wonderfully supportive husband, Fred, his nudging that her collections were slowly “taking over” inspired her to examine the real benefits of an actual – and larger – retail space. While stepping through the front door immediately energizes your creative juices, and you make mental notes of a quickly forming list of things you already want to purchase, June and her employees know that potential customers come in to get a feel for how they work as a team, and how their talents would complement their own design vision. “We are a one-stop shop, both retail and design,” says June. Most of their regular vendors tell her she has the largest fabric library of all the designers they service, which is indeed one of her personal goals. “It we don’t have it, we go to markets four times a year to make sure we can put our hands on it for you,” she explains. Both design clients and walk-in traffic are treated to her down-to-earth personality and passion for what she does. A multi-faceted company, June DeLugas Interiors also operates as a construction designer for new homes, providing turnkey remodeling for residential projects, and specializing in kitchen and bath remodeling, which is about 80% of their business. You can feel the love among the staff as June rounds out what she calls her “Dream Team,” with Associate Designer and Business Manager, Logan Allen; Sales Associate, Sample Manager, and Artist, Janet LaRowe; and Senior Designer, Elizabeth Lovette. As part of a small business, everyone embraces multiple responsibilities. “We help each other, and we have fun, too!” says June. You’ll also notice a focus on the kitchen in new construction, as it’s still the area that draws the family close. June’s inspiration can spring from a simple piece of granite for a countertop or a small swatch of fabric or even the home’s brick exterior, and the momentum for style and color keeps building as all the elements start to come together. June and her staff work with new construction from beginning to end, and have collaborated with Don Hamrick of Custom Homes by Hamrick for the past ten years on new and truly unique family homes. They have won both service and design awards for the Best of Houzz 2017, and several platinum awards from the Parade of Homes. 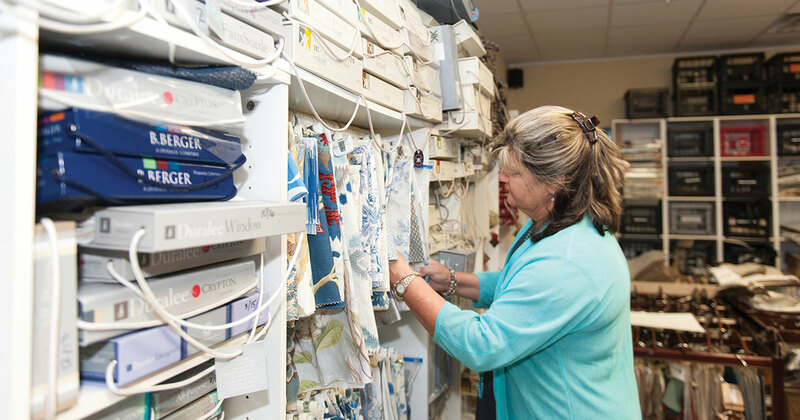 While she keeps busy with new construction and a wide array of remodeling projects as well, June is ultra-proud of the store that’s her home base and pleased that so many of the items sold there are part of her personal collections from over the years. 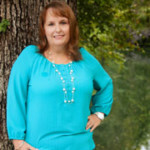 She calls her love of collecting a “good addiction” and has come into her own as a business owner and trusted consultant. Along with quality, American-made furniture brands – many of them manufactured here in the Triad – June DeLugas Interiors can oversee your order of custom window treatments and custom wood shutters from a local source, plumbing fixtures, granite countertops and even hardware for updated cabinets, while a seemingly endless array of carpet and upholstery fabric samples lines the walls. Perhaps the finishing touch, your master bedroom, can take on new life and offer much-deserved comfort with soft linens in soft colors from one of the ten lines of bedding they carry, paired with a down comforter and even a custom headboard to match. The store’s inventory is an eclectic mix of antique, modern, and transitional, and that brings a rich mix of possibilities to every new project. “Younger clients may think they want modern, but they still like the idea of having a favorite family piece or two in the mix,” says June, pointing out a traditional walnut secretary for sale in the store, that’s enhanced by a few modern accessory pieces. Having relied on her stellar intuition for her business success, June is the buyer for everything in the retail store, with a well-crafted knack for selecting the right piece for the right space. To usher in the holiday season, the store will host an open house, “An Artful Christmas,” on Tuesday, November 7, from 10 am – 7 pm. Four local artists will display their work, and you’ll enjoy inspiring holiday décor while browsing June’s collections – all treasured pieces that brought her happiness as she gathered them, and that are sure to find a perfect spot in your home. Get to know the creative team at June DeLugas Interiors by visiting junedelugasinteriors.com, or at their retail showroom conveniently situated at 2575 Old Glory Road, #100, in Clemmons. Showroom hours are Monday through Friday 10 am – 5:30 pm, with Tuesday hours 10 am – 7 pm, and Saturday by appointment only. For consultations call 336-778-1030 and follow them on Facebook and Instagram, as well as June’s trend updates on WSJS radio and a monthly column in Forsyth Woman.